Two holidays that couldn’t be farther apart. One of the biggest shopping days of the year and a protest against it. One of the biggest shopping days of the year. I just read on the Globe and Mail that two people were shot in armed robberies and 15 people pepper-sprayed last night and this morning during Black Friday madness. People are serious about their shopping! 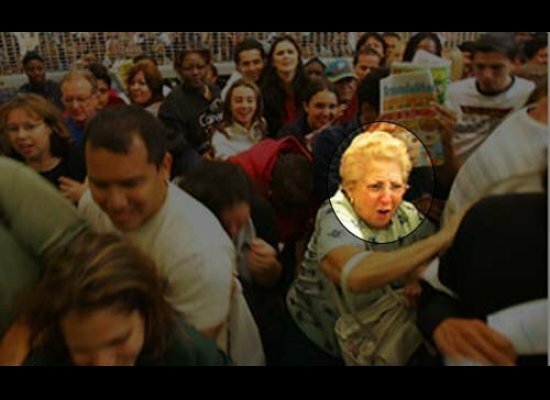 In other years shoppers have assaulted each other or even been trampled during the mad rush to get into the stores (one 34-year old employee of Walmart was trampled to death in New York in 2008). Black Friday is the day after Thanksgiving in America (and in recent years starting the night before, or very early in the morning), where retailers offer huge discounts on items and turn a profit, or go “in the black”. It is said to be the start of the Christmas shopping season. People line up for hours to get the best deals. A little too claustrophobic for me! Many Ontarians head south of the border for the good deals, often spending the night and making a mini-vacation out of it to avoid duty and taxes. There is a push, though, to keep consumers in Canada. Many Canadian companies are also offering Black Friday discounts today and this weekend. I did a little video I mentioned yesterday for the Toronto Star and a photo shoot for a photographer friend of mine, to promote local shopping. Buy Nothing Day is an international day of protest against consumerism, over-consumption and the extreme amount of waste that comes along with this. Started by Vancouver artist Ted Dave in 1992, it was promoted by Canadian magazine Adbusters and now has campaigns in over 65 countries. It is typically celebrated the same day as Black Friday in North America and the following day internationally. This year Adbusters has combined their efforts of the Occupy Movement with Buy Nothing Day events. #OccupyXmas will “put the breaks on rabid consumerism for 24 hours… Historically, Buy Nothing Day has been about fasting from hyper consumerism – a break from the cash register and reflecting on how dependent we really are on conspicuous consumption. On this 20th anniversary of Buy Nothing Day, we take it to the next level, marrying it with the message of #occupy…” Events include mall sit-ins, consumer fasts, credit card cut-ups, and whirl-marts (participants silently steer their shopping carts around a shopping mall or store in a long, baffling conga line without putting anything in the carts or actually making any purchases). Novemember 17 1939 – ten student leaders were executed by the Nazis and 1,100 student demonstrators were sent to concentration camps after anti-occupation student demonstrations. The Nazis also declared all universities to be closed for three years. 1941 – exiled Czechoslovak government proclaims November 17th to be International Students’ Day. November 17 1989 – fiftieth anniversary of the Nazi horrors. Students organize a peaceful protest. The crowd grows increasingly bold and critical of the regime. Police brutally suppress the protest at National Avenue. This was the spark to ignite the Velvet Revolution, which led to the end of the Communist regime in Czechoslovakia. 2000 – November 17 declared a state holiday. Struggle for Freedom and Democracy Day strikes a chord with me. As a former student, I am proud that a student protest could incite political change. I also can’t imagine living in a country where standing up for what you believe in will get you executed. This still happens many places around the world. I am forever grateful to have the fortune of being born in a country with freedom of speech. I also worry about the Occupy Movement. The Occupiers should continue to voice their opinion, but why not try peaceful protests or rallies – if the tent city isn’t safe, up to fire code, or healthy? You might find there are a lot of people out there who would support your cause if you were just clear on your message and were physically more in the public eye. Maybe then the revolution you are looking for could happen. It has been done before, in way more severe regimes, past and present. I’m going to pause this section until I’m feeling better and am actually able to celebrate anything that doesn’t involve me in my sweats at home. I know I was supposed to physically celebrate all these holidays. And I do emotionally when I write about them. But, sometimes health comes first. In recent years, people have decided to make donations to help the poor and needy instead of the animal sacrifice. When I attended Bonfire Night in England many years ago I was intrigued by the spectacle and enjoyed the party, but I never really thought of the political history that created the celebration. Even as I wrote my post yesterday about the Guy Fawkes story, it didn’t really hit home. Bonfire night is originally about lighting fire to effigies of Guy Fawkes to celebrate that he was executed and didn’t kill the King and the Parliament. Now it has become more anti-government, almost celebrating what Guy Fawkes tried to achieve, as opposed to his demise. Guy Fawkes masks are used as a symbol against government tyranny. Effigies of politicians are burned. How was I to celebrate this in Toronto? After passing up a suggestion to create an effigy of Rob Ford and burn it on the steps of City Hall (as much as I want to celebrate Guy Fawkes, I don’t want to end up with his same fate) and giving up on the notion that I light firecrackers and create a bonfire (I did this on Canada Day on the Island and it wasn’t very political then), I decided to honour the sentiment. Of course I couldn’t do it without a Guy Fawkes doll to accompany me (homemade of an old t-shirt, some duct tape, and stuffed with newspaper). My Guy Fawkes doll at the Occupy Toronto camp. Photo by Will O'Hare. Occupy Toronto tent city, where I can find a lot of people who understand that sometimes drastic measures have to be taken in order to achieve your political goals. I’ve been avoiding going there because I have major questions about what it is achieving and what is the end goal. I support some of the causes, but question the means. I needed to ask how and why and Guy Fawkes Night was the perfect night to do it. After walking throughout the tents, free school, information booth, placards and drum circle, I was watching a group of people singing and dancing. A gentleman approached me and asked me why I was watching and not taking part. I explained my reservations and told him my questions. Turns out he’s from Egypt here for six weeks in the Occupy Toronto camp – he was part of the revolution in Egypt. We spoke for a long time about the what, why and how. He believes in the need for parallel revolutions and a united people. He was part of what Guy Fawkes didn’t achieve. He gave me a different perspective. I didn’t end up burning my Guy in the end. He is a symbol of resistance to the status quo and I didn’t want that to go up in flames. We need that. Although there were no fireworks or bonfires or crowds of people parading through the streets, this Guy Fawkes Night was the first time I actually understood what it was all about.